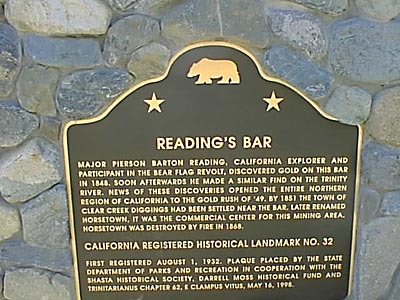 Major pierson Barton Reading, California explorer and participant in the Bear Flag Revolt, discovered gold on this bar in 1848. Soon afterwards he made a similar find on the Trinity River. News of these discoveries opened the entire northern region of California to the gold rush of '49. By 1851 the town of Clear Creek Diggings had been settled near the bar. Later renamed Horsetown, it was the commercial center for this mining area. Horsetown was destroyed by fire in 1868. 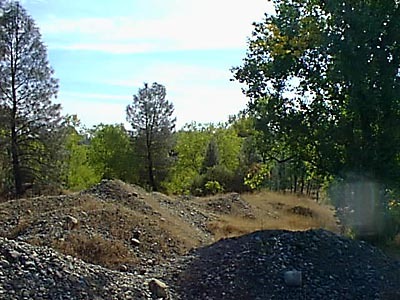 Near Clear Creek Bridge, on Clear Creek Rd, 6.9 mi W of Old Hwy 99W, Redding. Return to other landmarks in Shasta county.